Cinnamon, in powder or stick form, is the bark of a group of plants of the genus Cinnamomum. In addition to being a popular spice, cinnamon has a long history of medicinal use. For example, cinnamon is an ingredient in some ancient Chinese cold remedies. Despite the many potential health benefits of cinnamon, you should consult your doctor before adding cinnamon sticks or other cinnamon products to your diet. 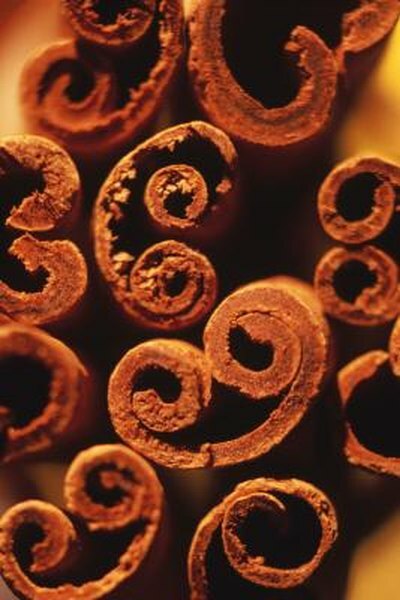 Some cinnamon products have high levels of coumarin, which can lead to liver damage and harmful drug interactions. Some studies suggest that cinnamon has antioxidant and antitumor properties. Antioxidants decrease the amount of damage caused by free radicals in the body. In contrast to most molecules, free radicals have unpaired electrons. Because electrons are much more stable when in pairs, free radicals take electrons from other molecules in the body. This causes damage, some of which can promote cancer if left unchecked. The two primary forms of cholesterol are HDL, which stands for high-density lipoprotein, and LDL, which stands for low-density lipoprotein. HDL is denser than LDL because HDL contains more protein, while LDL contains more fat. HDL is commonly called good cholesterol and LDL bad cholesterol. Cinnamon, even in relatively low quantities, is believed to lower a person's LDL and thus improve the person's cholesterol ratio and overall cardiac health. Several studies suggest that cinnamon may have anti-inflammatory properties. As arthritis is a common ailment involving inflammatory pain, cinnamon has been suggested as a potential treatment for arthritis. For example, traditional medicine in southwestern Nigeria uses cinnamon mixed with honey as a treatment for arthritis pain. Cinnamon may help regulate blood sugar. Some researchers have investigated the effects of using cinnamon as a treatment for type 2 diabetes, otherwise known as adult-onset diabetes. In type 2 diabetes, the patient's body cannot properly use insulin. As a result, the patient's blood sugar becomes elevated. This can lead to a variety of health problems, such as frequent infections and even blindness. The results of these type 2 diabetes studies are inconclusive.